Air Pacific takes delivery of its first of three new A330-200 aircraft on 19-Mar-2013, heralding the start of a new era as a rebranded Fiji Airways. But the carrier will chart its new course without inspirational MD Dave Pflieger who is returning to the United States when his three year contract ends in May-2013. Mr Pflieger will be a tough act to follow, having delivered a quite remarkable turnaround of Air Pacific’s fortunes during his tenure. Mr Pflieger led a 360 degree review and restructure of an ailing Air Pacific, financially putting the carrier back on its feet by reversing record losses, re-equipping its wide-body fleet and culminating in the airline rebranding to its 1960s name, Fiji Airways, in Jun-2013. Mr Pflieger will take up a new position as president and CEO of United States regional carrier Silver Airways based in Florida. His departure is a potential risk to Air Pacific’s expansion plans, particularly in the valuable United States market where Mr Pflieger’s American airline background meant he was well placed both to understand and implement connections and leverage the codeshare agreement with American Airlines which was signed in Dec-2011. The board has commenced a search for a new MD. It will require a leader with a steady hand on the tiller, able to build on the platform laid down by Mr Pflieger. Possible internal candidates could include CFO Nick Caine, GM of domestic subsidiary Pacific Sun Shaenaz Voss and CCO Aubrey Swift. All three have extensive aviation industry experience and were appointed or promoted by Mr Pflieger and are therefore intimately aligned with the strategy. Mr Caine joined Air Pacific in Jul-2010 having spent about 20 years in the industry working for a variety of airlines including full service carriers British Airways, South African Airways and Swissair and LCCs easyJet and Jetstar. Ms Voss was promoted to GM of Pacific Sun in May-2011 from her previous role as GM of guest services, airport and inflight for Air Pacific. She has a background in the aviation, tourism and service industries. Mr Swift has held commercial roles at British Airways, Virgin Blue and Virgin Australia – where he helped design, launch and grow the carrier. Air Pacific is due to receive its first of three new A330-200s on 19-Mar-2013. The other two will be delivered in May-2013 and Nov-2013. The new aircraft will be equipped with 24 angled lie-flat business class seats and 249 economy class seats. The business class seats are a distinct improvement over the recliner seats on Air Pacific's Boeing 747-400s. Apart from the improved inflight product, the A330’s superior range and payload capabilities will to allow Air Pacific to grow existing markets and expand its international network. The A330s will also bring instant fuel cost savings of up to 45% over the two Boeing 747-400s they will replace. The A330s partly replace a cancelled order for five Boeing 787-9s placed in 2006, originally slated for delivery in 2011. The first A330 will make its debut on the Nadi-Auckland route on 02-Apr-2013. Hong Kong-Nadi follows on 04-Apr-2013 and Brisbane-Nadi from 21-Apr-2013. Sydney-Nadi will be added from 08-Jun-2013 after the arrival of the second aircraft along with Los Angeles-Nadi from 01-Jul-2013. Melbourne-Nadi will be included in Dec-2013 once the entire fleet is in place. 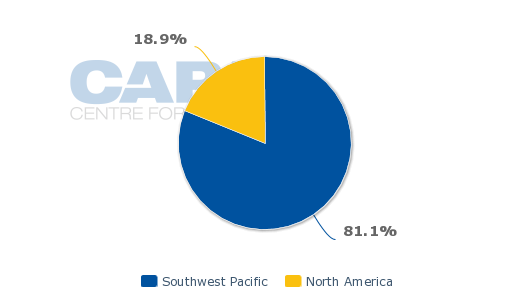 Air Pacific has already announced frequency increases on key long-haul routes. Los Angeles-Nadi will move from four weekly services to six in Jul-2013, initially using a mix of A330s and Boeing 747s. Frequencies will increase to daily all-A330 services in Nov-2013. The 747s are expected to exit the fleet by the end of 2013. Hong Kong services will also be increased to three-times weekly in Jan-2014 from twice weekly. Sydney and Melbourne will each receive an additional weekly service using a mix of A330 and Boeing 737 aircraft, with Sydney moving to 14-times weekly in Sep-2013 and Melbourne to six weekly frequencies in Dec-2013. 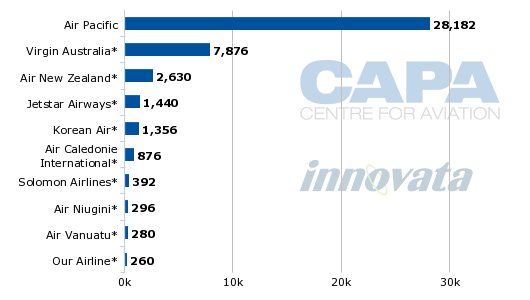 But the carrier will apparently substantially reduce its capacity to Australia and New Zealand in Apr-2013, particularly to Sydney and Brisbane where the number of weekly one-way seats offered will drop to below Virgin Australia’s capacity, according to Innovata schedules. Air Pacific has not specified the reason for the reduction, but it is probably due to the rebranding programme of the Boeing 737 fleet. Air Pacific expects to complete its rebranding programme by the end of 2013, including upgrading and repainting its Boeing 737-800 and-700 fleet in Fiji Airways livery. As part of its rebranding, Fiji Airways will drop the tropical colours of Air Pacific for a traditional Masi symbol on a brown block background. "We wanted a new and distinctly Fijian symbol and brand mark that would help us best represent the country while also ensuring our planes stand out at some of the world’s busiest international airports" Mr Pflieger said. Air Pacific will seek to use its new structure, image and widebody fleet to compete more effectively with Australian carriers Virgin Australia and Jetstar which, with their lower cost bases, collectively have won more than 50% market share on the Australian routes in recent years. Air Pacific has been holding its own against the Australian competitors through better pricing and improved scheduling and improved product. There could be support for its cause on the Australian routes as Virgin Australia and Qantas focus on their fierce domestic battle, while Jetstar has its hands full establishing its new Asian operations. Air Pacific carries about 65% of all inbound traffic to Fiji and deploys about 81% of its capacity around the Southwest Pacific with Australia, and in particular Sydney, its main inbound market. Tourism has become the backbone of the economy earning FJD1.05 billion (USD587.5 million) in 2010, accounting for about 25% of GDP and employing about 40,000 people. Inbound tourism numbers have more than doubled since 2000 from 293,183 to 675,050 in 2011, despite political ructions which included a military takeover, leaving the once-democratic country under the control of a dictatorship, ironically strongly condemned by the governments of Australia and New Zealand, the source of the majority of its tourists. Fiji is served by nine international airlines with national carrier Air Pacific providing the bulk of the capacity, followed by Virgin Australia and Air New Zealand. The country attracts more than 85% of its capacity from Southwest Pacific, with Australia the biggest market. This heavy dependence on Australia means Fiji ideally needs to diversify its tourism source markets. One option being considered is developing air links with the United Arab Emirates. Fijian Prime Minister Voreqe Bainimarama, who led the 2006 coup, has stated he wants to discuss open skies agreements with the United Arab Emirates to develop long-haul tourism markets including from the UAE and South America. UAE Foreign Minister’s assistant for economic affairs Khalid Ghanim Al Ghaith recently indicated the Gulf state is interested in an open skies agreement with Fiji which would boost tourism in Fiji and increase connectivity between the two countries and sub regions. “With the policy in place, the UAE intends to link Fiji to countries in South America such as Chile, Peru or even Brazil, which will be of great benefit to both Fiji and the UAE,” Mr Al Ghaith said. There is also the need to find a solution to the uncomfortable impasse between the Fiji Government and Qantas over the Australian flag carrier's 46% shareholding in Air Pacific. In Mar-2012 the Fiji Government issued a contentious decree requiring the airline to have local citizens comprise two-thirds of the board. 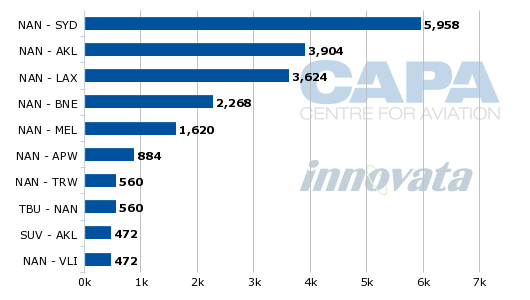 The Fiji Government owns 51% of the airline and Qantas held four of the nine board seats. 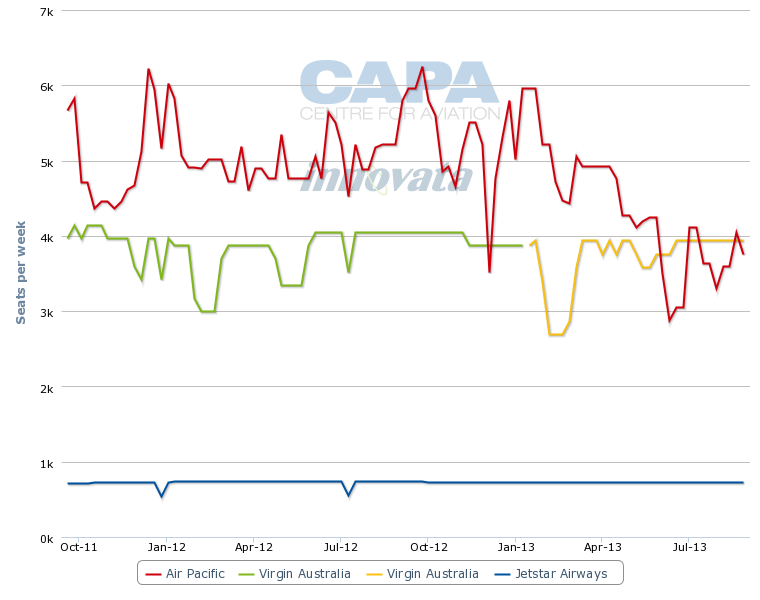 Faced with having to give up one of the directorships, Qantas withdrew all four in May-2012. Qantas has been trying to sell its holding to the Fiji Government, which while willing to buy, is not prepared to pay Qantas’ USD70 million asking price. Other buying interest is unlikely. Meanwhile, the situation is not helpful to either side. Fiji Government’s tourism development plan targets annual visitor arrivals to reach one million by 2022, according to tourism officials. To achieve that objective, Fiji will however need to diversify its inbound markets, improve its international links and create a more stable political environment to encourage international investment. For its part, Air Pacific is moving to fortify its position on the Australian routes in 2013, while growing the United States market, supported by the new product on board the A330s. The airline has always been considered a vital underpinning to provide access for tourists to Fiji and successive governments have sought suitable ways of ensuring its survival, even in the face of stiff competition from low cost airlines out of Australia and New Zealand. The potentially massive Chinese market is also quickly discovering Fiji, with inbound numbers growing to more than 24,000 from a standing start in just three years; the Japanese market is also showing signs of recovery and the United States has potential. Growth in these Pacific Rim markets will help offset the decline in visitors from budget conscious Europe, particularly the UK, long a staple for South Pacific destinations, but who have turned to cheaper and often equally attractive options closer to home. An open skies agreement with the UAE, if it were to eventuate, could also open a host of possibilities for Fiji tourism and Air Pacific, feeding from the Gulf carriers’ global networks. Mr Pflieger’s successor has big shoes to fill, but the success or otherwise of the bold restructuring of Air Pacific will depend to a large extent on matters beyond the airline management’s control – the global market, fuel prices and the always-unpredictable Fijian Government. Given the influence Mr Pflieger has been able to bring to bear in turning the airline around, his successor will clearly have a vital role to play.